Hands, Head and Heart: Sporty Shoes, Just for You! This project uses one of the very first designs I uploaded to my blog, but I've done some updating with my "Just So Sporty" set and finally gotten around to creating a template for it! For a pdf of the template, click here. This A2 sized shaped card* opens to look like two little shoes and looks fantastic sitting out on a shelf with the rest of your athletes trophies, team pics and memorabilia! It can be adapted for any sports you need cleats or athletic shoes(using the different sports in "Just So Sporty"), and made more colorful with a coordinating color of CS or adding stripes to the side or a "whoosh" with scrap CS. I used a Cropodile to make the holes for the laces. Buy your own shoelaces or make some from twill tape and Scotch tape wrapped around the ends like I did here. I used one piece through the holes attached at top and bottom with glue dots, then made a bow out of the remaining piece and stuck that to the top with another glue dot. For girls shoes, you may ant to try some fun ribbon instead!) and my piercing tool to poke a design into the card front (difficult to see in top pic, but see below) Embossing in a contrasting color (this is Vanilla to match my natural twill I got from SU!) is a great way to add authentic looking designs to your shoes. (Again for girls, think how fun self adhesive rhinestones and colored/shaped eyelets would be!) 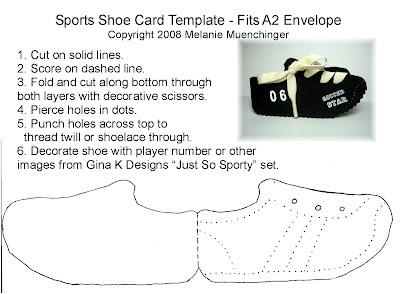 On this sample, I added my son's number "06" and "Soccer Star", using "Just So Sporty". Please enjoy this original pattern of mine, but if you share it please remember to give me credit and do not submit this design for contests, thank you! This card is soooo cute, Melanie. I can,t however, get the pattern to print. Could you include it as a PDF file. WOW! I love it! I needed something to make for my dd soccer coach. Now I know just what! THanks for sharing! Oh, wow, this is super cute and what a great card for a young athlete or a coach. I love fun projects like this. As always, you are sooooo creative! This is awesome. It would be great for the child athletes in my life. But I too couldn't print it without the pdf file, so if anyone knows how to do that, I would also greatly appreciate it. Melanie, you need to have Adobe Acrobat (not just Adobe Reader) to be able to "print" to a PDF. This is how I usually make PDF files. I'm not sure if there is another way. Good luck! Wow, this card is great!!!! What a fabulous idea! Thanks for sharing!! This card is way too cute! I love it. Thanks for sharing the template and instructions. I am going to try a girl shoe. Oh sooooo coooool!! I swear Mel.......you have the most creative brain!!! LOL I'll have to go check for the template!! Oh my gosh...this is darling!! Thanks for sharing the template and all of the deets!! Nice and cute shoe blog for kids "sport shoes"